Almost exactly two years ago we did a "Cobaya" dinner – Experiment #24 – at The Dutch. Number 24 was one of only two Cobaya dinners over the course of the past nearly five years that I couldn't attend. 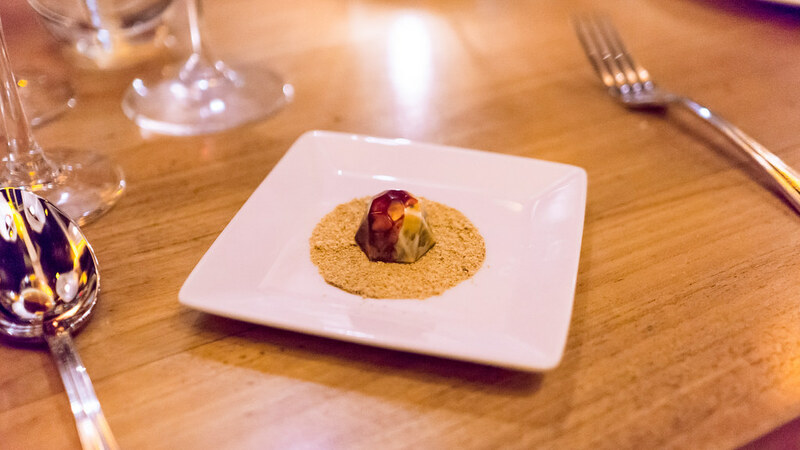 It was a tough one to miss – Chef Andrew Carmellini came down from New York and put on a show that many veteran guinea pigs say was among the best we've ever had. 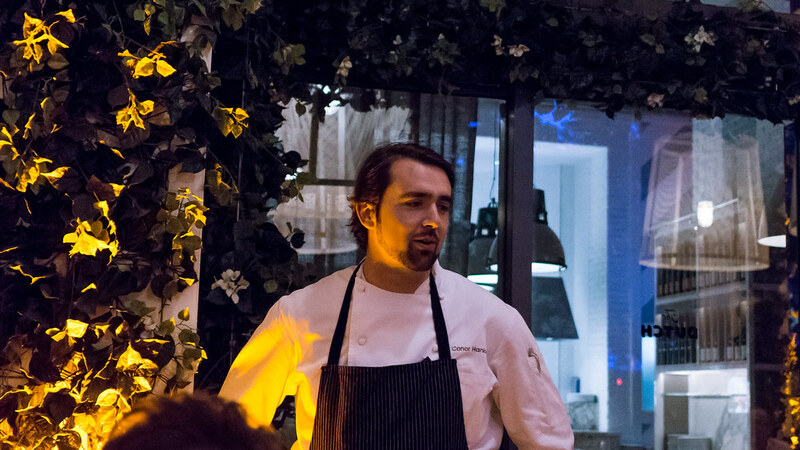 Since then, I've been to a number of great events at The Dutch: the Hurricane Sandy Relief Dinner we helped coordinate in late 2012, a really classy Spring Equinox Dinner that The Dutch's local chef de cuisine Conor Hanlon put on last year with chef Brad Kilgore (before Brad was hired at JG Grill), an indulgent "Trufflepalooza" a few months ago. But what I really wanted was another Cobaya, this one with Conor getting to do his thing. It came together this past week, and fortunately, I didn't miss this one. We had a smaller group than usual – only 25 – at Conor's request, so that he could really focus and do more complex, individually plated items, rather than the family style service we've had at prior events. 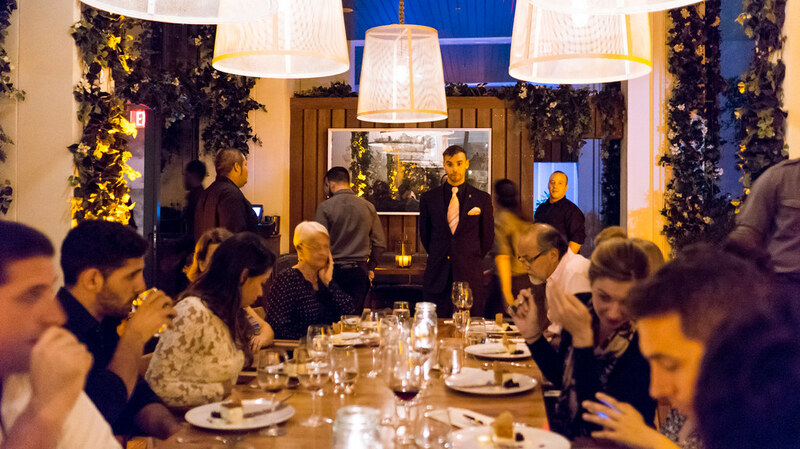 His menu spanned ten courses, each round dramatically delivered to the table simultaneously for all diners at once by a swat team of servers. 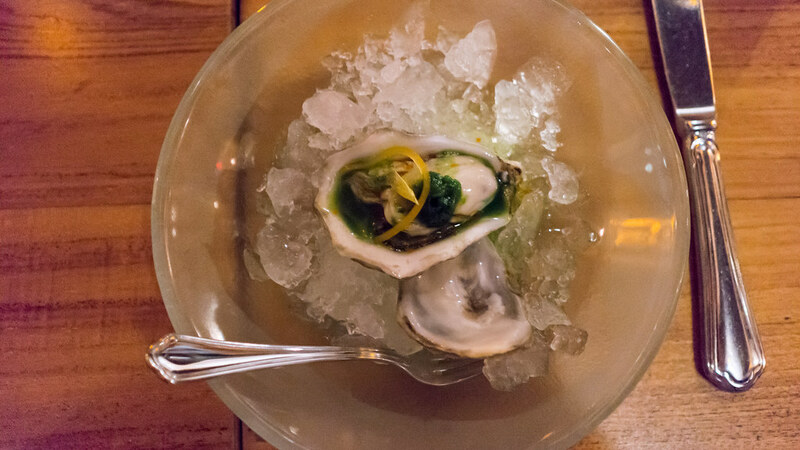 We started with a raw Stellar Bay oyster on crushed ice, garnished with a spicy, vegetal nasturtium granite, roasted tomato oil, celery, and Meyer lemon: a lot of flavors packed into one bite, designed to duplicate the flavors of a Bloody Mary. 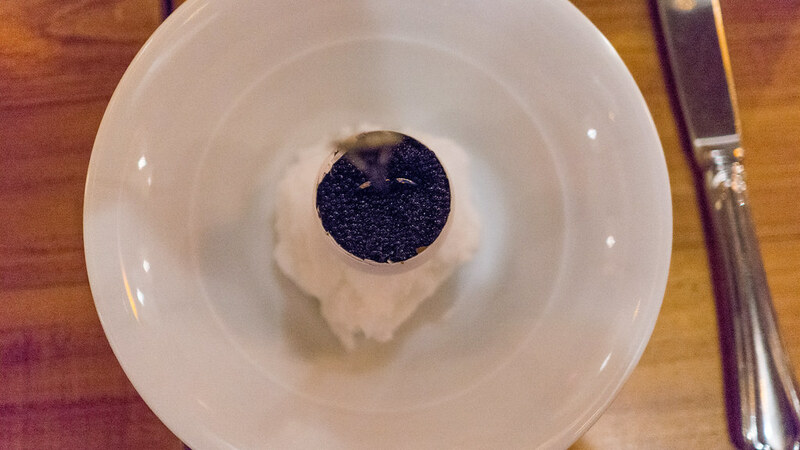 Another spin on classic flavors: Conor's "Eggs on Eggs" packed a silky deviled egg farce into a cleaned eggshell, and then spackled the surface with a generously thick layer of black bowfin caviar. The briny saline pop of the roe was a nice contrast against the creamy, mildly spicy egg mousse. I was floored, though, by the next course. 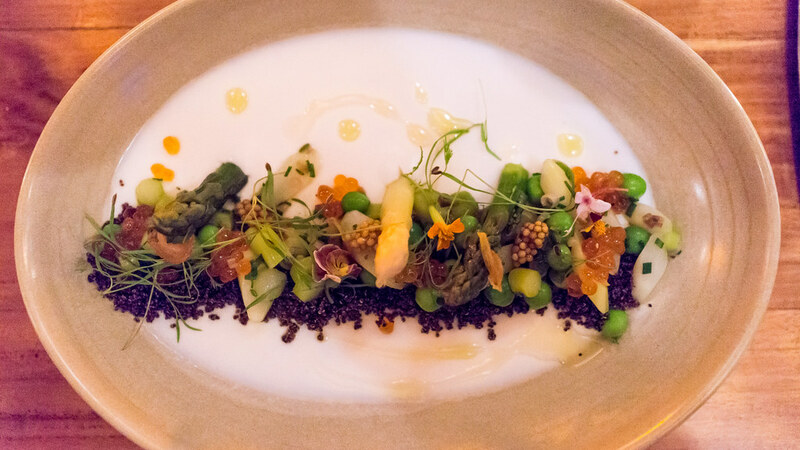 A creamy, tangy buttermilk panna cotta served as the base for a composition that was like a spring cornucopia: stalks and spears of white and green asparagus, fresh shucked peas, golden-orange smoked trout roe, pickled mustard seeds, a tangle of delicate greens and flowers, all nestled into a bed of crispy dark brown quinoa. Every bite yielded a different combination of flavors, textures and colors. Just an outstanding dish. 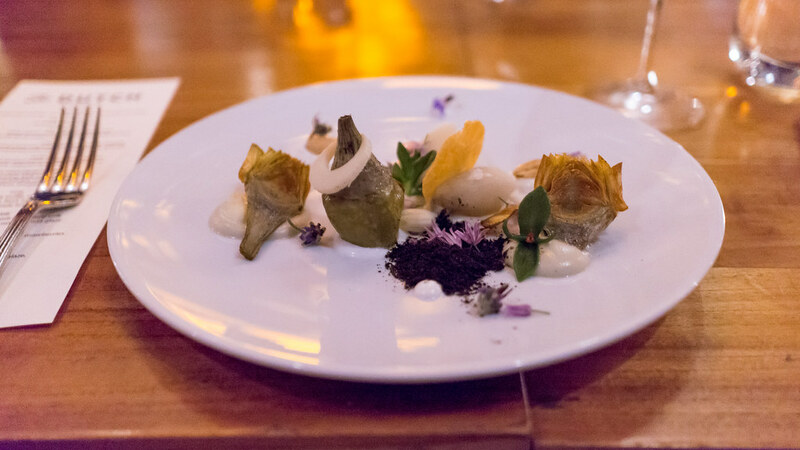 The next course stuck with the seasonal theme, a meditation on spring artichokes. They came both roasted and all crispy on the edges, and poached in a bacon barigoule, along with some sunchokes and hearts of palm (similar textures and flavors), almonds, goat's milk yogurt, smoky leek ash, and purple chive blossoms. The next course also brought the West Coast to mind. Conor called it "A Dish from the Sea," and it included sweet, tender New Zealand langoustine, medallions of king crab, plump scallop, and peach-hued tongues of uni, along with mounds of golden paddlefish and Chinese osetra caviar, various seaweeds, a bed of dashi fluid gel, and a splash of "sea foam." It reminded me of the shellfish "tide pool" I'd had a few years ago at David Kinch's Manresa in Los Gatos, California. 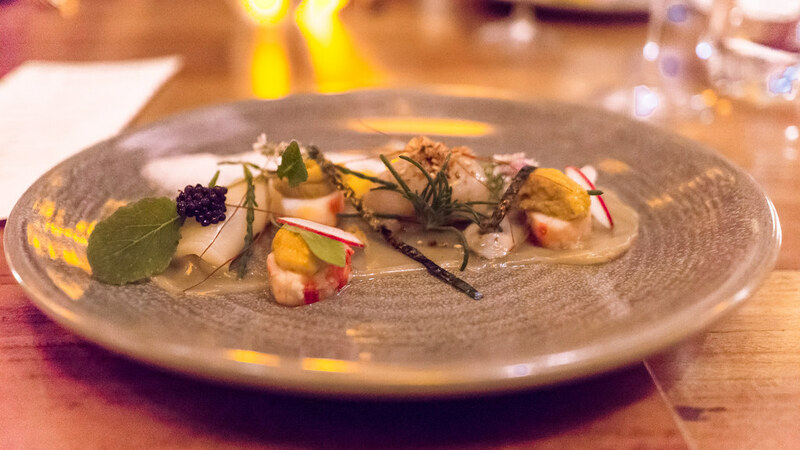 I only wished the dashi gel had been lighter-textured – it seemed overly thick and sticky, particularly compared to all the delicate seafood on the plate. 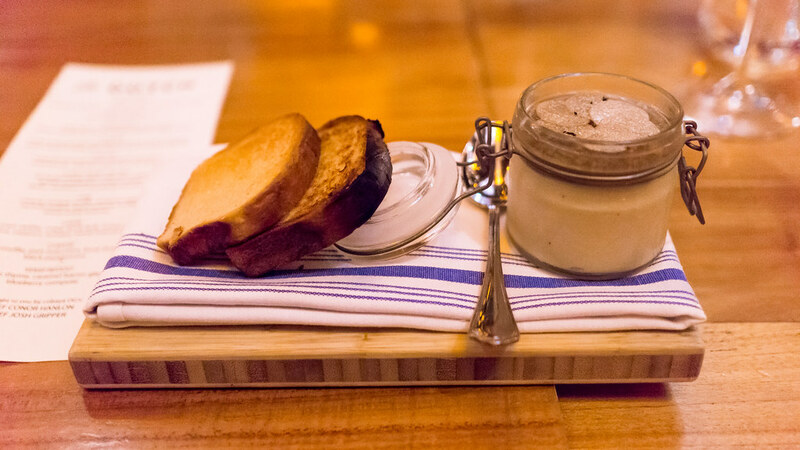 One of my favorite dishes of last year was a foie gras "parfait" Conor ran as a special during a visit we paid over the summer. It made an appearance in another, even more luxurious guise, on his Cobaya menu. 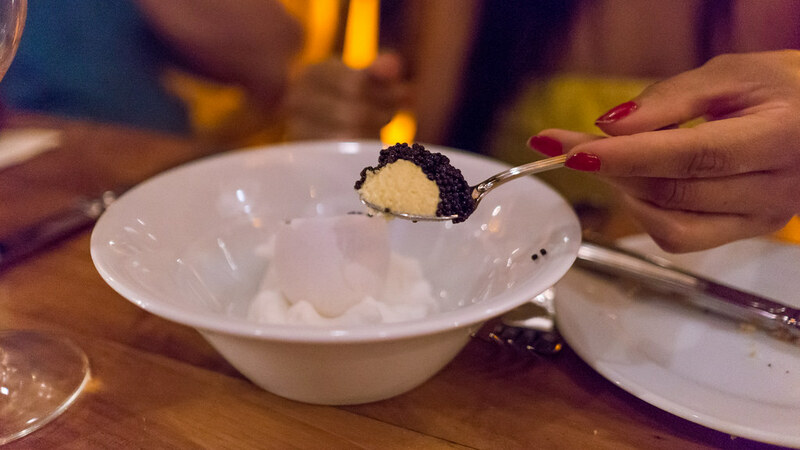 Here, a jar of a rich foie gras custard was topped with a Sauternes gelée that brought both sweetness and acidity, along with elegant, thin rounds of aromatic fresh summer truffle, served with light-as-air house-made brioche for scooping. I wanted to stow away half the jar to take home with me for the next day. 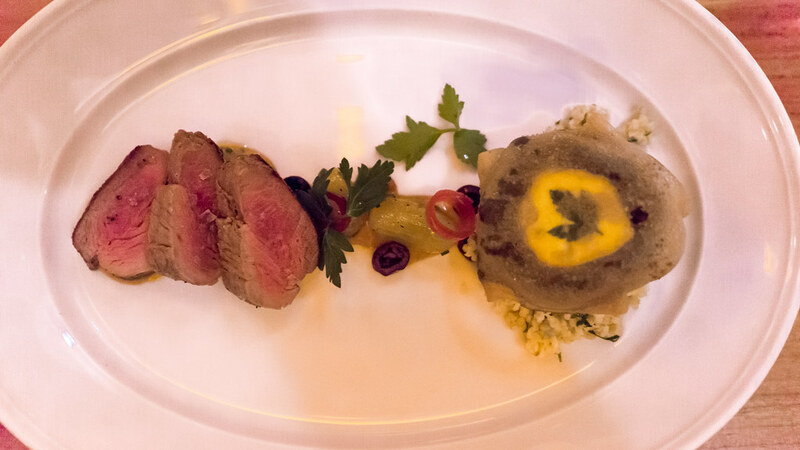 Conor and Brad did a gorgeous lamb dish for last year's Spring Equinox Dinner, served up family style. This time, Conor did individual plates and turned out another great dish. On one side, slices of a perfectly rosy roasted lamb saddle. On the other, a gorgeous brik pastry filled with minced lamb and a runny egg (note the parsley leaf showing through the so-thin-it's-translucent pastry). Merging the two, some flavors of the Mediterranean: olives, peppers, tomatoes, and a sweet harissa glaze. 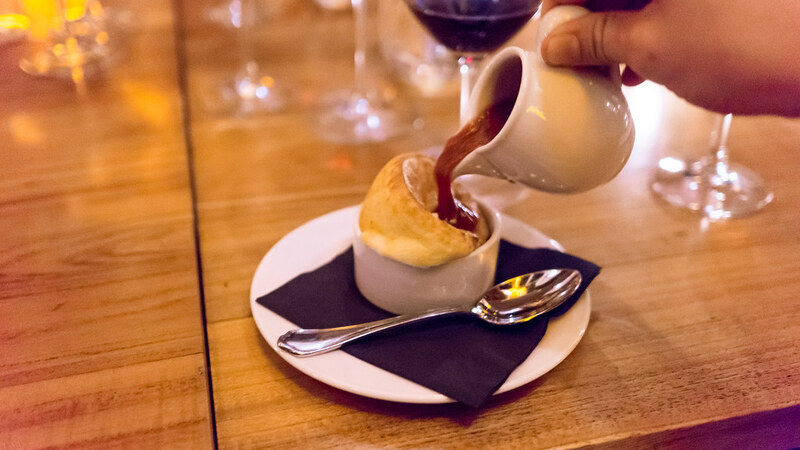 Conor then yielded the floor to The Dutch's extremely talented pastry chef, Josh Gripper, who first served up a pre-dessert cheese course of a sort: a textbook Taleggio cheese souffle, assertively peppered, and doused tableside with a jammy reduction of local strawberries and port wine. Gripper's desserts at The Dutch tend toward the comfort foods: his pies are a highlight, and they are outstanding. For us, he went more contemporary in presentation while still bringing out those homey flavors. 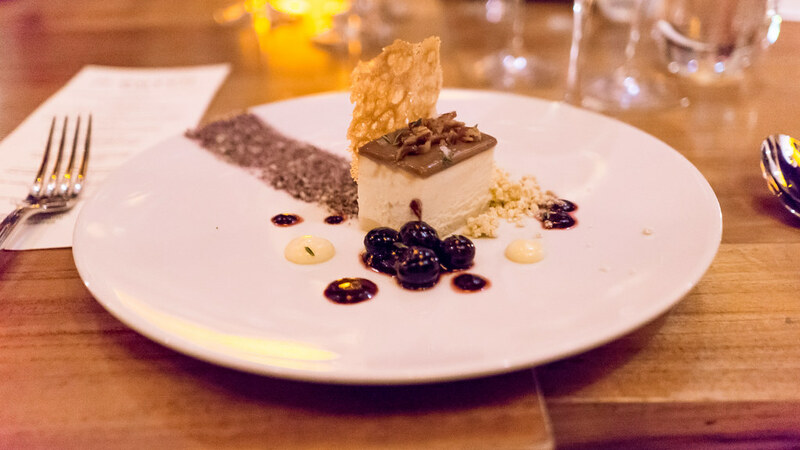 Here, he did a creamy cold semifreddo topped with a bacon glaze, and paired with plump sweet blueberry compote. And as a final bite, an elegant and delicious chocolate and Tokai bonbon. In case anyone didn't get enough, he also sent everyone home with a baggie of white chocolate bark studded with blueberries (which my kids appreciated when they found it the next morning). It was great to give Conor a chance to do his thing, and the results were really exceptional. 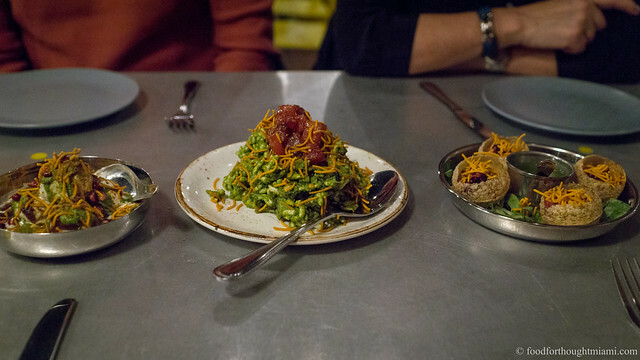 It really was a standout meal among the many great dinners we've had over the years. A big thank you to Chef Conor and the Gripper, to The Dutch's sommelier for putting together some excellent pairings for those who opted for them, to the whole crew at The Dutch who were operating with military efficiency all night to get ten courses out to the table for simultaneous presentation, and as always most of all, to the guinea pigs whose interest and support make these kind of events possible. You can read my sad, in absentia recap here. You can see a video of Patterson making his popcorn grits here and get a recipe here. 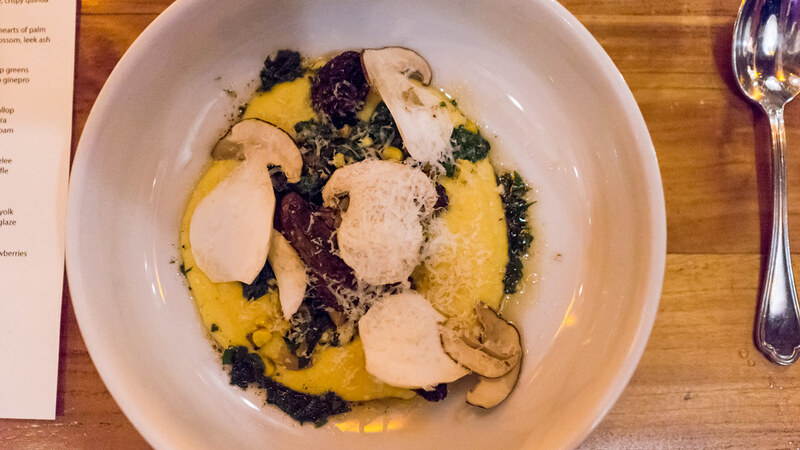 The buttery Martinelli Bella Vigna Chardonnay with the mushrooms and popcorn grits dish was particularly memorable.